EasyLanguage tutorial 139 demonstrates how to create sub-charts on a form docked to a price chart. 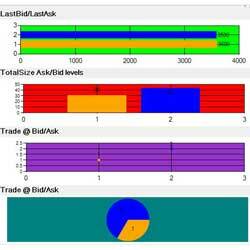 The tutorial program uses a Market Depth Provider and a Time and Sales Provider. In the tutorial video, I demonstrate how you would go about creating the chart configuration settings using the TDE ToolBox and then copying from the designer generated code. You could also use the tutorial program as the basis for you own modified program. The main method has several inputs and two outputs. The inputs determine the title of the chart, the background color, and what sort of chart is it (e.g Pie chart, bar chart, bubble chart or column chart). The outputs are the chart itself and the chart data series associated with it. The charts are highly customizable, however in this tutorial I have used fairly simple setups. Unfortunately, this program does not work with MultiCharts. The data in the sub charts begins to be updated from when the program is first applied to the chart or turned from inactive to active. The tutorial 139 show me study (_Tutorial139) is available for download for $39.95 by clicking the following link. 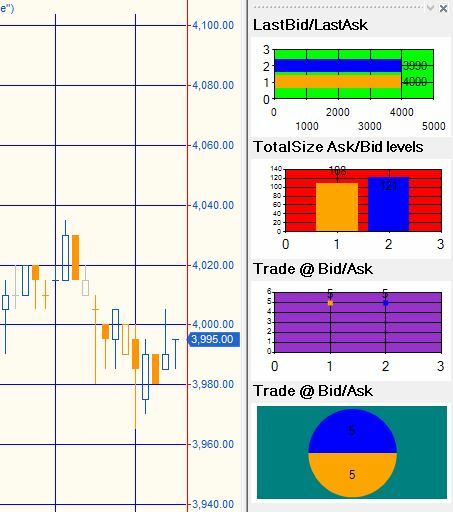 The program works with TradeStation version 9.5 and newer versions.